Trustee – MET League of Colleges stated that "Learning is fun and is also the greatest adventure of our lives. At MET Rishikul Vidyalaya first the teachers and parents should be educated and then only the child can be taught properly. Therefore, all the parents and teachers undergo special training programmes to understand the nuances of raising a child and managing their lives. Regular sessions for the parents and teachers in order that their learnings are enhanced and they are thus able to teach the child in the best manner are held”. It is about developing a child naturally and to develop the child's intelligence and not just the memory. With this objective MET Rishikul Vidyalaya – a school where tradition and technology meet; had presented two empowering seminars in the field of ‘Child Brain Development’ on Tuesday November 18, 2008 at MET Convention Centre. 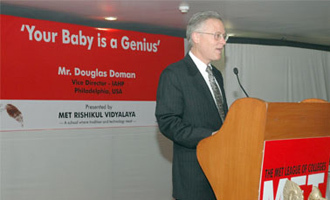 These seminars were addressed by Mr. Douglas Doman, Vice Director – The Institutes for the Achievement of Human Potential (IAHP), Philadelphia, USA on ‘How To be a better parent’ (The importance of early intellectual stimulation & physical - opportunity) and ‘The Pathway to Wellness’. (How To Help A Developmentally Delayed, Cerebral Palsied, Hyperactive, Autistic, Mentally Challenged, Down’s Syndrome, Brain Injured Child). The programme was conceptualised to treat the cause of injury and not the symptom by the family members. It was authored by Glenn Doman a world-renowned educationist and a pioneer in the field of ‘Child Brain Development’. He is also the founder of The Institutes for the Achievement of Human Potential (IAHP), a non profit organisation providing teaching programmes and books designed to improve and accelerate the mental and physical development of normal as well as brain injured children. Over 300 teachers and parents attended and benefited from the knowledge for their child.